At LDCS we provide transportation bus service for eligible pupils. We make every attempt to ensure buses will be running on schedule. We offer pick up and drop off services from different locations in city. Our Staff is well informed and a background check has been carried out to ensure your kids are in safe hands. The transportation staff is available to address any questions or concerns by phone 0831-2458965. 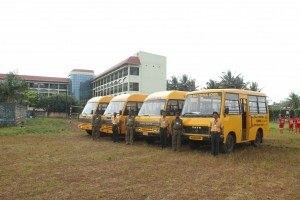 School bus stops and pick-up times are established by the Transportation Department. only students assigned to the bus route are allowed in the bus. each student will be picked up and discharged at designated stops only. Students in grades 2 through 5 will be let off at the bus stop only with a parent or guardian present. We also ensure regular bus attendance is taken for extra precaution.